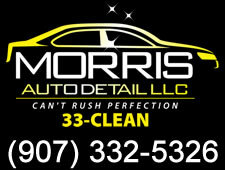 SO JUST EXACTLY WHAT IS AUTO DETAILING? Detailing is an art-form, a passion, a creative outlet so to speak. It’s not for everyone as it requires a lot of time and practice to really do it well. It’s not just throwing some soap in a bucket and wiping the car down real quick. It’s much more than that. It’s making sure that the car is washed and dried properly to avoid damage to the car’s surface, scrubbing and wiping all panels in one direction to minimize those horrible ‘swirls’ that are so common on most people’s cars. It’s making sure that every nook and cranny has been cleaned to keep the car looking pristine which will not only add life to the car but also value to the car if it is to be sold or traded in. A clean car makes not only the ‘detailer’ feel good, but also the owner of the vehicle feel like there vehicle is alive again!